Duke is a three-year-old Golden Retriever who lives in Omaha with Hubert, a two-year-old Golden who was trained as a service dog. The dog’s guardians set up this dog behavior training session to get Duke to stop jumping up on people, stop pulling on the leash and stop them from charging the door when guests arrive. Duke met me at the door as soon as I arrived. It took the more laid back Hubert a few minutes before he decided to come over to say and hi. 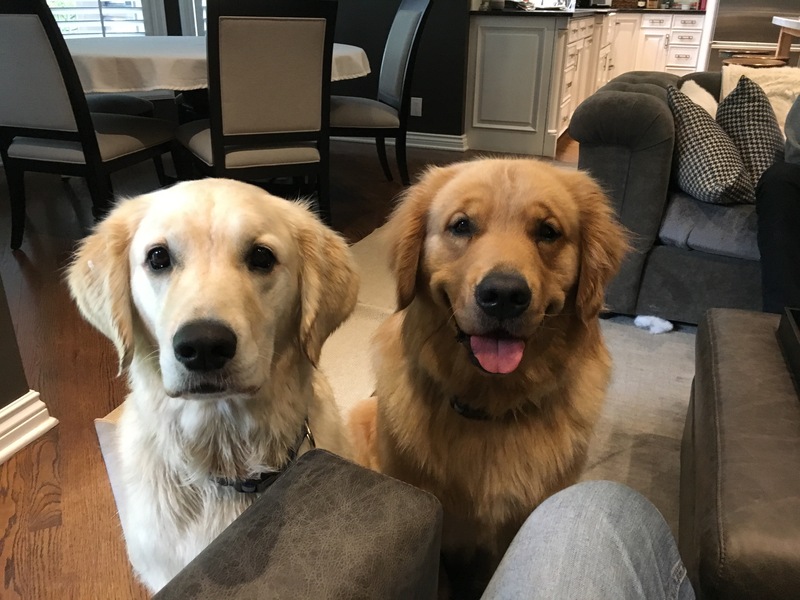 This pair’s good dog behavior was a good example of why so many people seek out Golden Retriever’s as service dogs due to their calm demeanor. When I sat down with the guardians to chat about the dog behavior help they wanted, I noticed that they petted the dogs any time they got close. Got close isn’t the best description as the dogs kind of shoved their heads in between the human’s legs, nudged or jumped up on them for attention. There is nothing wrong with petting your dog, but paying attention to when you pet your dog is important. Anything your dog is doing when you pet it is what you are rewarding the dog for (in the dog’s mind). So each time the dogs jumped up, nudged or pawed at their humans for attention and they responded, they were training the dog to jump up, nudge or invade their space as he best way to ask a human for attention. For this reason I suggested the guardians stop petting the dogs when they demand it and instead tell the dog to sit or lay down first. I call this Petting wth a purpose. This dog training secret is one of the easiest things any dog guardian can do with their dogs. Not only does it train the dog to engage in a more desirable behavior to ask for attention (sitting in front of the person), it also helps the dog start to see and respect the human as an authority figure. During the session we went over a number of dog behavior and dog training exercises. While running through them, I noticed that Hubert did not have what we call a “soft mouth,” aka taking treats gently. I spent a few minutes showing the humans how to get Hubert to stop snatching treats. After we finished up the inside the house exercises, I turned my attention to the pulling on the leash. For most of my clients, this unwanted dog behavior starts as soon as they attach the leash. But in this case, the dog stayed calm while the leash was attached. Stay in position next to the human, not in front. Keep your arm loose so there is no tension on the leash. No stopping when the dog stops to sniff. Sniff while moving forward only. No marking. Dog needs to eliminate before and or after the way, not during. Now these rules are only for a Structured walk. To say a dog must walk this way every time is not reasonable or practical. Walks should be fun for the dog, so once the dogs are walking better, then the guardians can give them some extra leash and let them stop and sniff later. I recommended the guardians have me come back in a month or so for a dog training session to train the dogs to walk in a heel with a loose leash. Leash training is best done in a session where it is the sole focus as it takes a lot of repetition. Usually I say that the dogs were calmer at the end of the session, but these dogs were pretty well behaved and trained by their guardians before I came over. Most of the session was spent sharing some fine tuning tips and suggestions and pointing out a few behaviors the humans were doing that were confusing to the dogs. We wrapped things up by going over what I like to call the Roadmap to Success. You can watch Hubert and Duke’s roadmap by clicking on the video below.